Sweet Providence Choose & Cut Family Farm is nestled in the rolling hills just outside of scenic Floyd, Virginia, and less than an hour’s drive from our Tanglewood Mall retail location. 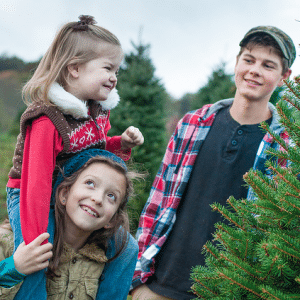 We are a small family-run, family-owned farm and we proudly raise and cut all the trees that we sell so when you buy your Christmas tree from us you can rest assured that it was freshly cut.Our family friendly store location provides you and your family the perfect opportunity for a fun family trip – choose and cut your own tree from our wide selection, and you’ll be assured you get the perfect tree. As always, every tree we sell is hand trimmed year after year at Sweet Providence Farm to ensure its perfect appearance. As Christians, we work for the glory of God and strive to produce quality products of real value to you and your family. Thanks for taking a moment to see what we’re all about.